Oops - we don't appear to have a video for the DocuMate 272. There's a lot to like about the Visioneer Xerox DocuMate 272 document management scanner - the faster, better, easier-to-use workgroup scanner solution for vertical markets that need to scan plastic ID cards as well as mixed sized documents. 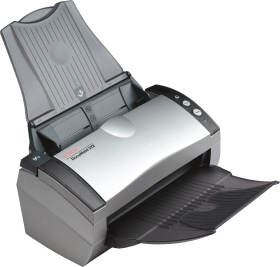 30% faster than the leading brand workgroup scanner in duplex mode, the DocuMate 272 is the price and performance leader in its category. It also includes a powerful suite of applications that improve image quality, OCR accuracy, and document management. And its revolutionary One Touch scanning and small compact size make it easy to use on any desktop or in any department. When a patient is admitted to the hospital, the registration staff makes a copy of the patient's driver's license and insurance card to put with the file. The insurance information is then keyed into the database. In healthcare, about 20% of the claims submitted by hospitals are denied by the insurance companies. Ninety percent of those are due to typographical errors. By scanning patient documents, insurance cards and driver's licenses at patient registration and creating a digital image accessible to the patient's authorized care providers; hospitals can reduce registration time, solve data inaccuracy problems and improve customer relationships. The DocuMate 272 quickly handles many different tasks at hand - right at the desktop. It has a 50-page automatic document feeder that scans up to 66 images per minute using dual CCDs - doubling your speed and productivity for two-sided documents. The DocuMate 272's powerful software, robust functionality, and hardware specifications deliver the speed and quality you would expect from a more expensive scanner. A searchable PDF feature lets you send, copy, paste, re-use, and highlight text while maintaining the integrity of the original document image. The bundled Kofax VRS software provides such capabilities as autoexposure and wide angle de-skew. VRS also helps improve the accuracy of recognition software, thereby reducing the need for manual correction of intelligent character recognition and OCR results. And document size is not an issue for the DocuMate 272. It scans everything from business cards and photos up to legal-size documents, with superior image quality. The DocuMate 272's One Touch technology scans from the desktop to nine different customizable applications or devices, and documents can be converted to text-searchable PDF in one easy step. Now you can instantly search documents for keywords or phrases. The DocuMate 272's one-step installation is a snap with the plug and play Hi-Speed USB 2.0 port. And its small footprint, just 6" x 13", makes it ideal for the desktop. Get superior results with Kofax VirtualReScan, an award winning, patented technology that automatically ensures the best possible image quality and OCR accuracy for scanned document images. As pages pass through the scanner, VRS performs a multipoint inspection of each document, instantly checking and adjusting alignment (skew), brightness, contrast, and image clarity. Transform volumes of paper or photos into organized digital files that you can quickly find, use, and share. In PDF format, you can instantly search documents for keywords or phrases. This gives them additional archival benefits beyond traditional storage, and the widely accepted PDF format lets everyone view and print documents - on any computer. The DocuMate 272's PaperPort software lets users convert existing electronic files to PDF for storage or transfer. Supported file types include Microsoft Office, Corel, and AutoDesk documents, as well as the popular TIF, MAX, JPG, and BMP formats. The included QuickScan Demo Version software provides all the necessary capabilities for high-speed ISIS based scanning, image enhancement, viewing, annotation, and printing of images for both black-and-white and color pages. Developed by Pixel Translations, the creators of ISIS, QuickScan's strengths include features such as batch scanning, PDF support, image manipulation, multipage support, and more. DocuMate 272's One Touch feature lets you send documents to preselected destinations, including searchable PDF. Quickly turn PDF files and stacks of papers into easily editable word processing and spreadsheet documents. ISIS drivers certified by Pixel Translations ensure that the DocuMate 272 functions properly with the more than 250 commercially available ISIS-compatible imaging and document management applications.